Saltwater taffy is a classic candy that usually brings up lots of fun memories. Soft and chewy in texture with fun swirls of color, there are a seemingly endless variety of flavors that you can make this in. Pulling taffy is a big job—and a long job—so if possible, recruit a friend or family member to help. It will make the job faster and even more fun. Spray a rimmed baking sheet with nonstick cooking spray. Combine the water, corn syrup, granulated sugar, and salt in a 4-quart saucepan over medium-high heat; stir until the sugar dissolves. Then wash down the sides of the pan with a wet pastry brush to prevent sugar crystals from forming. When the sugar syrup comes to a boil, insert a candy thermometer. Cook the syrup, without stirring, until the thermometer reaches 255 F (123 C). This temperature will produce a wonderfully soft and chewy taffy. If you like your taffy stiffer, cook it to 260 F for a medium-firm taffy or 265 F for a very firm taffy. Once at the proper temperature, remove the pan from the heat, add the butter and flavoring, and stir until the butter melts and everything is well-mixed. Pour the candy onto the prepared baking sheet and let it spread out. Add the marshmallow cream and food coloring on top. Let the candy cool until it starts to set around the edges, about 5 to 10 minutes. Slide a spatula under one edge of the candy and fold it into the center, over the marshmallow cream. Then fold the other edges of the candy into the middle, making a compact package. Put on food-safe plastic gloves to protect your hands and spray them with nonstick spray. Gather up the candy and knead it together until the marshmallow cream and coloring are mixed in. Holding the candy in both hands, pull your hands apart, stretching the candy into a rope between them. Bring your hands back together, twist the candy together, and repeat the pulling process. At first, the taffy will droop and fall, but as you continue to pull the taffy, it will cool down and become firmer and easier to manipulate. Continue to pull the taffy for 20 minutes until it holds its shape well and becomes difficult to pull. You will start to see parallel ridges in the pulled candy toward the end of the process; this is a sign the taffy is ready. Divide the taffy into quarters to make it easier to work with. Roll the taffy into a long thin rope about 1/2-inch in diameter. Use oiled kitchen shears or a sharp knife to cut it into small 1-inch pieces and repeat with the remaining taffy. Wrap the taffy in waxed paper to help it keep its shape and prevent it from sticking together. Taffy making may seem like a fun activity to do with your kids, but you will need to exercise caution, and it can be a bit more work than you anticipate. The syrup will get very hot, and you do need to take care when pouring the mixture into the pan. The pulling and stretching can also become a bit arduous, so be prepared for a workout! 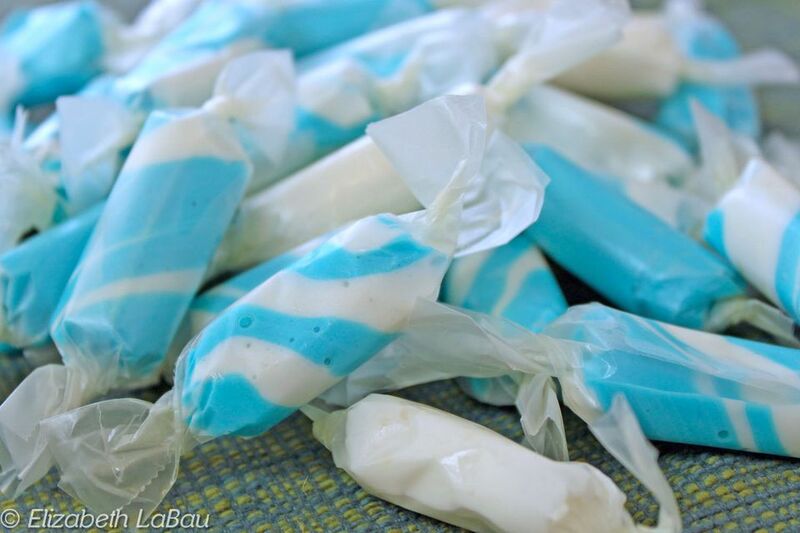 You also want to keep the weather in mind when planning to make saltwater taffy. Humidity can cause the candy to absorb moisture and not harden the way it is supposed to. Homemade salt water taffy can be stored in an airtight container at room temperature for up to two weeks. You can keep it longer, but over time it will start to lose its soft and chewy texture. This recipe calls for flavoring extract of your preference and obviously the particular flavor you choose will create a specific taste, such as lemon, vanilla, mint, or chocolate. You can easily change the flavor—and color, by using different food coloring—of each recipe. To make striped taffy, prepare two baking sheets and divide the sugar syrup evenly between them. Add half of the marshmallow cream to each batch and different colors of food coloring on top. Pull each batch individually and roll them into long thin ropes. Twist the ropes of different colored taffy together, then pull them thin so that the colors blend. Cut and wrap the striped taffy as usual.